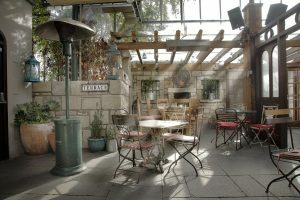 Winner of ‘Best Outdoor Space’ in Ireland in the Sky Bar Awards 2016 and The Irish Pub Awards 2017, and Regional Winner of ‘Best Outdoor Space’ in The Irish Pub Awards in 2018, The Terrace offers patrons the best of both worlds – Enjoy a beverage and banter under the skyline in cosy surroundings all year around! 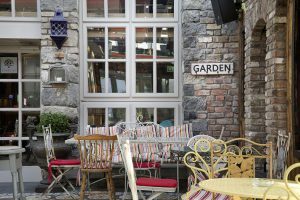 With its adorable shabby-chic old world elegance and charm, The Terrace is a destination suited to casual catch-ups, post work mingling, weekend socialising and all kinds of special celebrations. 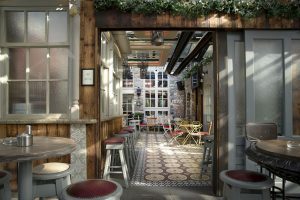 Its décor is French vintage or shabby chic style with exposed brickwork, soft pastel tones and aged features that create a rustic and dreamy ambiance. Powerful heating and a retractable roof allow total control over the elements so that patrons can enjoy a cosy drink under the starry night sky or soak up the morning or midday sun. The Terrace is open 7 days and 7 nights each week and has a late bar at weekends.